A little note: Most of what I write on this blog is principle based and applies to people of all religions. My goal is to unite people on the common ground we share--our desire to strengthen families. This specific post talks about a couple of programs run by my church, but the organization ideas could be implemented in a variety of ways. Thanks for visiting! Our church has two beautiful programs for youth who are between the ages of 12 and 18. The program for young women is called "Personal Progress,"
and the program for young men is called "Duty to God." Moving through these programs requires the youth to accomplish a series of assignments and activities--like what you would do if you were certifying to become a fitness instructor or a lifeguard. 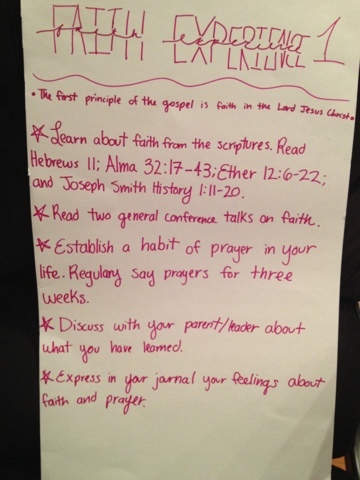 The purpose of these, however, is to help our youth deepen their faith in Christ and develop attributes that will strengthen them throughout their lives. I completed my Personal Progress when I was 18, and now my daughter has been working on hers for about a year. I love it. As I have spoken with a variety of parents and leaders in these youth organizations, however, I've found that there is a need for a more clearly-defined tracking sheet and process that will enable each participant to identify the "next action" required to move each assignment forward. 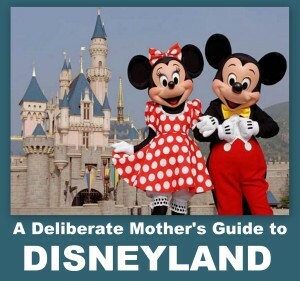 So for the past several months, I have been trying to figure out a way to apply the principles I teach in my mom-focused organization program to these youth programs. After lots of trial and error, and some wonderful advice from our youth and my friend Michelle, we are ready for "beta testing." (1) You download a copy of the tracking sheet (one sheet will probably last a couple of months or so). 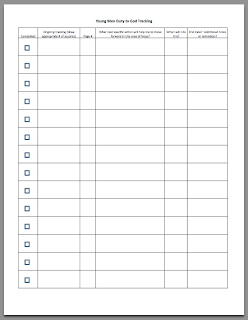 Click here for the Young Women Personal Progress Tracking Sheet. 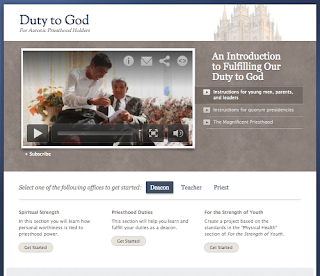 Click here for the Young Men Duty to God Tracking Sheet. (2) Once you print it, you'll want to trim the paper, so when the form is folded in half, it will fit right into the Personal Progress or Duty to God book. 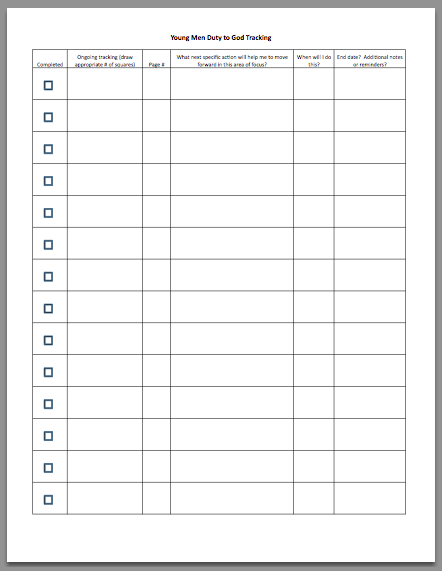 (3) Once a week, your youth (possibly with the help of a leader or parent) will take just two minutes to look through their books, choose the next specific action they'd like to do, and record the details on this tracking sheet. 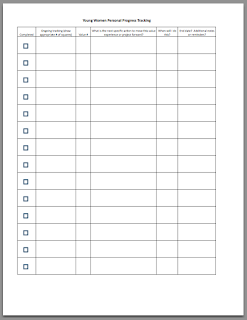 The first column has a single box that will be checked once this "Next Action" is completed. The second column is an optional spot where the youth can draw their own boxes for assignments that require a bit of ongoing tracking. If it says to do something "every day for two weeks," they would draw 14 little squares. If it says, "once a week for three weeks," they would draw three squares. That's pretty straightforward, right? In the third column, they record where the assignment can be found in the book. For the Young Women, the column is titled "Value #," and something like "Divine Nature, Experience 3" would be noted as "DN3." For the Young Men, I simply labeled the column with "Page #," since that book is more loosely organized around general areas of focus. In the fourth column, the "Next Action" is listed. This is supposed to be really specific. Something like, "Memorize this scripture:_____________" or "Record in my journal how I felt about the service project I did this past week." The fifth column simply says, "When will I do this?" This gives the youth a chance to think about their schedules for the week and identify a time they could work on their Personal Progress or Duty to God. This also enables them to easily transfer the assignments onto their calendars or into their phones as reminders/alerts. The final column is simply a place to add notes. Something like, "Daily for two weeks, ending on June 16th" or "I want this one to be an ongoing habit." Last week, I was invited to speak at a youth event (where the Young Women and their parents were in attendance) and show them how to use this tracking sheet. I recorded about 7 minutes of that class and posted it here, in case you would like to watch it. I uploaded a mobile-sized video, so you can't read the words on the board very well, but the chart is patterned exactly like the zoomed-in picture above, and I'm explaining everything aloud as I go. I hope this is helpful to you. I'm excited to get your feedback, and I'd love to know if this works for your youth and if you have any ideas to make it simpler or more effective. I got a call last night from my sister, telling me my mother fell and broke her hip and was admitted to the hospital. My heart has been aching for her all night, and the first chance I got, I drove out to see her. 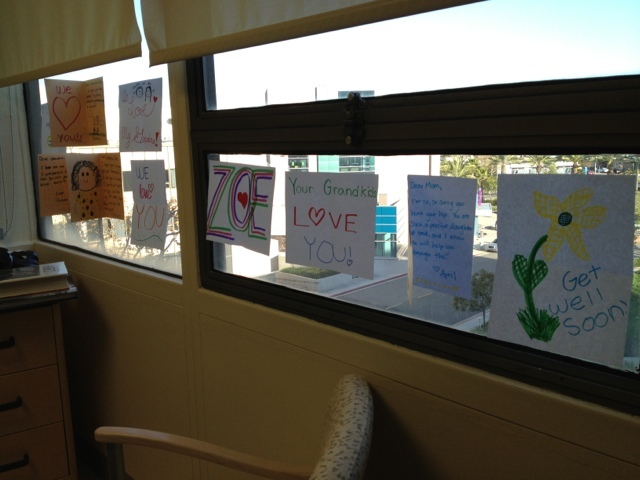 The children and I made cards for her, and Alia hung them all over the windows. I'll give a better update later, but I just wanted to explain what's been going on around here. 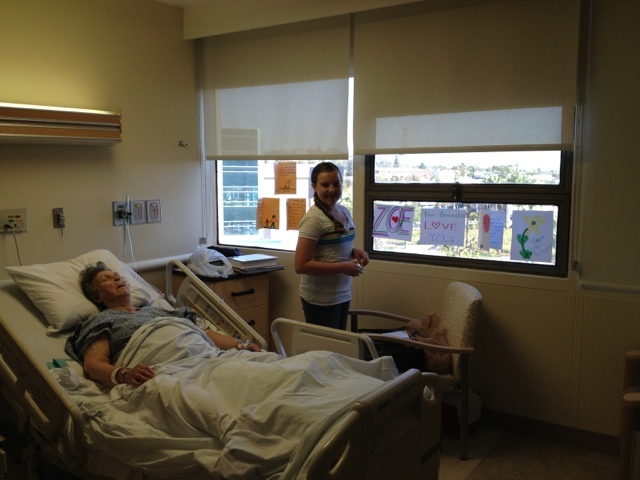 My mom is in generally good spirits as she awaits surgery (8am tomorrow). And every time she wakes up, I can tell she doesn't know what's happening or where she is, but she smiles at me and holds my hand and says, "Oh, April, we've got lots of fun." This has been a hard, hard week, and this is the first day I'm out of bed from my own sickness, but I'm just grateful to spend a little bit of time with this precious lady. Alia came home with a little cough on Monday afternoon. It turned into a croupy kind of cough that lasted for two sleepless nights, accompanied by a fever, body aches . . . the works. She had to miss four days of school this week and is still huddled in a little ball in our family room, waiting to feel better. Then Grace came home with a fever yesterday and needed to take some time off of school, as well. Our home is a whirlwind of medicine, cough drops, humidifier treatments, thermometer-sterilizing, and lots of cat naps in random places. It's been a tough week for all of us, and I'm trying to fight the tickle in my throat and get enough rest so I can take care of our family. I had a serious case of the "blahs" today and couldn't really do anything, and I was feeling discouraged that my energy and productivity has been so low this week. Eric put me down for a nap and reminded me to stop expecting so much of myself. I've realized that "productivity" DOES includes taking care of sick children. It's not as visible, but it's more important than any of the other projects I had on my schedule. I think my biggest realization, however, has been how much I miss my healthy girls. Alia typically cooks dinner several times a week and Grace manages much of our laundry. They also clean their zones, help empty the dishwasher, clean up after meals, and pitch in with lots of other little jobs. So now, with both of them sick, I'm scrambling to pick up those jobs--in addition to making sure the bedding is washed, the door knobs are bacteria-free, and everyone has enough fluids, snacks, hugs, and back tickles. Can't wait until everyone is healthy! xoxo to all the families out there going through sickness right now.